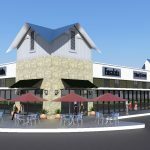 Houston-based Weingarten Realty has started on the 25-acre retail part of the 2,400-acre Stevens Ranch community in the Far West sector. The site will include a 20,000-sf retail shell, five one-acre pad sites, and one 18.3-acre pad site. Delivery is slated for the fall. Tenants will include Supercuts, Quarry Nails, and Smilepoint Dental Group. Fulcrum Construction is the general contractor for the project, which was designed by Luna Middleman Architects.